Many of our products are made on site, meaning that we are able to make to measure gates, fence panels, pergolas and much much besides! Speak to us about your requirements. Have you moved invested in a new property perhaps moved into a new home over Christmas that has a log fire and you’re unsure how to use it? Well, we’ve got you covered. You may not know but Weston Sawmill offers logs and coal for fires, guaranteed to keep you toasty during the last few months of Winter. Log fires are the perfect setting for a romantic night, an evening relaxing with friends or on your own with a book or a catch up of television. They set the mood for peace and harmony. There are two methods of lighting a log fire; either top down or bottom up lighting. Quite simply the former meaning you light from the top and the latter lighting from the bottom. Our team here at Weston Sawmill would recommend top-down lighting, as it produces less soot and ashes. Ensuring better air supply as well as your first set of wood last longer. Ensure all vents in the fireplace are open and put the logs on the bottom of the fireplace. Make sure your wood is cleft and dry and have your logs thick as a fist or thicker. Add a layer of small logs, then two layers of kindling (also available from Weston Sawmill). Put a couple of fire firefighters on the top layer of the kindling wood, or alternatively some newspaper. Beware though as newspaper creates excess amounts of ashes and contributes to more soot. Now you can light your log fire and close the door, depending if your chimney creates a good draught you may need to open the door to the wood stove, until the fire really gets going. If your home or cabin is ‘too’ insulated, you may also need to open a window in this case. We hope you found this guide to lighting a log fire useful and remember if you need logs, kindling, smokeless or regular coal; you can purchase all these items from Weston Sawmill. 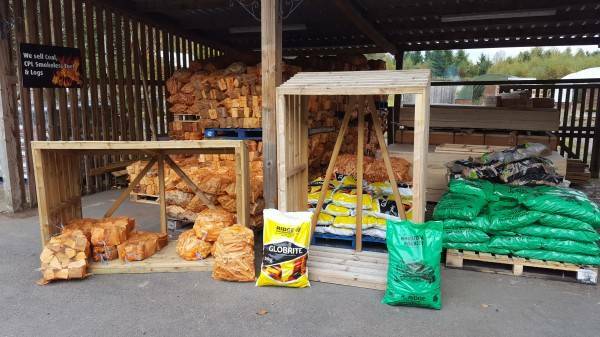 Weston Sawmill is based on the Shropshire/Staffordshire border, and have been providing logs and coals as well as wide range of garden landscaping solutions including high-quality fencing, garden furniture and gates for over 20 years. Contact us today and our friendly team will be able to advise you on the best logs and coals to keep your home fires burning right through the winter. This entry was posted in Weston Sawmill and Nursery and tagged logs and coal, Weston Sawmill on January 18, 2019 by admin.